The beauty of art. The talent of an artist. A gift from a son. And a chosen one with the greatest gift of all. This beautiful portrait was created by a remarkably talented young man. His works are diverse and each one masters raw human emotion. This is just one of his many art pieces. I enjoy them all, but this one took painstakingly many, many hours. It’s drawn with dots. Amazing work. Such a talent! It’s a gift. 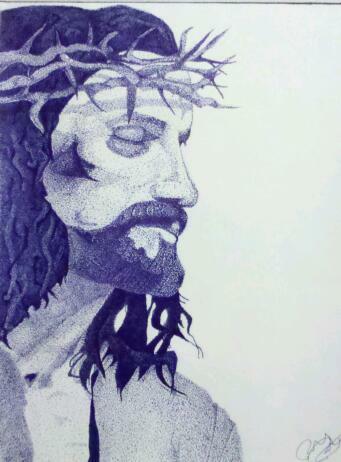 I did this piece with a blue ink pen by stippling for many, many hours. The whole piece is done with small dots of ink. It is now framed and hanging in my parents house. Gifted to my mom.